In a recent interview, Robert Malley, one of the President’s most trusted advisors on the Middle East, once again enumerated the competing priorities of US Syria policy: the need to balance humanitarian concerns with the desire to “preserve state institutions” and avoid a power vacuum so that the country does not slide into total anarchy. Having spent years researching and tracking the regime’s armed forces, I disagree. As far as attempts of estimating regime strengths go, observers suffer from analytical shortcomings. They overemphasize absolute number of soldiers fielded as well as square miles of territory held (less black, more red — less Islamic State, more Syria Arab Army!) in favor of softer measures of government reach and control, from economic and governance issues to qualitative differentiation of forces. As the regime deteriorates, so does its force structure. Yet, if our state-building adventures in Iraq and Afghanistan taught us anything, it was not to fall for the formal trappings of weak state institutions and to ignore color-coded maps informed by faulty metrics. At its heart, a civil war is almost always a dispute over the basic premises of communal life and the institutions that structure it. As such, internal government dynamics are at least as important as battlefield successes and the movement of frontlines. So unless Syria is soon going to run out of fighting-age males, small arms, or pick-up trucks, we better start paying attention to structural dynamics underpinning a conflict that has now raged for more than five years. Indeed, after five years of war, the regime’s force structure today is not entirely different from that of opposition militias. While much better supplied by the Syria Arab Army’s still-standing logistics skeleton, the government’s fighting force today consists of a dizzying array of hyper-local militias aligned with various factions, domestic and foreign sponsors, and local warlords. Aymenn al-Tamimi’s profiles of loyalist militias provide some insight into their diverse backgrounds. Among these groups, only a handful are still capable of anything close to offensive action. Much more so than sectarian or demographic limitations, this fragmentation is the direct result of the interaction between national and local economic and governance pressures. As the once totalitarian Syrian central state atrophies, its constituent parts — be they sectarian, rentierist, or simple brutes — have gained a stunning degree of political and economic independence from Damascus. Contrary to what others have claimed, Assad’s regime has not struck some grand bargain with a large section the Syria’s urban Sunni population. Instead, he has elevated to power the most brutish elements of the country and doubled down on the sectarian, tribal, and thuggish inclinations of its base. Today, where briefing maps now show solid red across Syria’s western governorates, they ought to distinguish dozens and perhaps even hundreds of small fiefdoms only nominally loyal to Assad. Indeed, in much of the country, loyalist security forces function like a grand racketeering scheme: simultaneously a cause and consequence of state collapse at the local level. Those following the Syrian Civil War closely will be familiar with two mobile formations responsible for most of the regime’s heavy lifting. They are the so-called “Tiger Forces” and the “Desert Hawks” (tracking regime militias has really become an exercise in taxonomy — mostly birds and big cats), currently operating in Aleppo and Latakia respectively. These units function as a kind of armed fire brigade: rushing across the country, putting out local conflagrations and rebel offensives, while on occasion leading their own offensives. In those cases, and much like the opposition, they assemble a curious collection of local warlords, regime remnants, and foreign support into temporary alliances and operations rooms. As an introduction to the Tiger Forces, we can turn to Robert Fisk’s fawning account of his “audience with…Bashar al-Assad’s favorite soldier,” Suheil Hassan, who leads the Tiger Forces. Hassan is an officer of the regime’s feared Air Force Intelligence Directorate. Besides leading what is said to be the government’s most elite fighting force, he is also thought to be one of the architects of Assad’s scorched earth and barrel-bombing campaign. Hassan enjoys almost cult-like popularity among regime supporters. The real story of the Tiger Forces is far less glamorous, yet far more instructive to those trying to understand the regime. During the early days of the uprising against Assad, Hassan coordinated the suppression of protests in Hama, an effort that relied on a collection of ordinary thugs, air force officers, and area tribal leaders. His effectiveness was found in his ability to rally local support rather than depending on the already crumbling state institutions. In due time, this early network of enforcers would evolve into the so-called Tiger Forces. While the unit has since developed a more stable core of permanent quasi-soldiers, Tiger loyalists today still hail from a vast web of militias, criminals, and smugglers stretching across Syria’s central and arguably most strategic province of Hama. Many of his direct subordinates have become notorious throughout the country for brigandage, smuggling activity, and general lawlessness. Earlier this year, Ali Shelly, a powerful thug from the town of Tell Salhab who is directly responsible to Hassan, pushed his abuses to the point where the regime finally had him arrested and thrown in jail. However, within days, Shelly was released and returned to the frontline. Such incidents should be seen as more than mere bureaucratic infighting over corruption. According to interviews I’ve conducted, Hassan loyalist warlords are widely known to smuggle guns, people, and oil to the Islamic State and opposition territory, directly undermining the regime’s war effort. But the central government has little choice but to look on helplessly. A report in my possession by the Syrian Arab Army’s provincial security council from last month details a recent instance where Shelly’s forces were caught with truckloads of smuggled weapons hidden underneath bags of wheat. They engaged in a prolonged gun-battle with state security forces. And they suffered no consequences. You might wonder why. The answer is fairly simple: There is no force loyal to Damascus today that is strong enough bring these brigands in line. A few days later, five military intelligence soldiers were killed in an ambush laid against them on the Shelly gang’s turf in the southern al-Ghab plain. A number of state institutions have been desperately trying to contain the Tiger Forces. There have been persistent rumors that at least one of the multiple assassination attempts against Hassan himself originated in the Military Intelligence headquarters. Besides some residual agriculture, trafficking in fuel, guns, and people has become the dominant form of economic activity throughout much of Syria. And loyalist militias are cashing in. Armed groups purportedly under Assad’s banner have quickly learned to exploit bottlenecks in the local economy to emancipate themselves from Damascus’ tutelage — particularly when it comes to one of the most fungible of commodities: fuel. In another incident in Hama this summer, Syrian military forces discovered multiple tanker trucks of smuggled petroleum on their way to Islamic State territory. Fearing retaliation from Talal Dakkak, instead of confiscating and distributing the looted goods as proscribed, the officers quickly handed over the fuel to the local air force intelligence directorate. At that point, according to a local source in Hama, it disappeared once again. While never a petro state, the sale of oil had accounted for more than 25 percent of pre-war government revenue and was responsible for a significant portion of the country’s foreign exchange reserves. After years of war, the regime’s formal command economy, especially its hydrocarbon sector, has all but collapsed. This summer, Islamic State militants blew up the last major gas facility still operating in the country, exacerbating the already tenuous situation in the country. Syria’s ever accelerating economic and fiscal tailspin has not only wiped out savings, diminished wages, and thus thrown millions into poverty, but also precipitated a dramatic currency collapse as I have seen from my own collection of black market exchange rates across Syria. Whereas the effect of inflation on military recruitment has been widely documented, currency depreciation has other secondary effects: At current rates, imports of basic goods have become prohibitively expensive. Meanwhile, the government price controls and producer monopolies have driven local producers into idleness and raised the incentive for smugglers to traffic what few goods enter the country right back across the border. The resulting price hikes, shortages, and rationing had a debilitating effect across the country, while making some men with the necessary know-how and muscle tremendously wealthy. Consider for example the Desert Hawks, the regime’s second most important offensive formation and bitter rivals of the Tiger Forces. This unit was founded by the brothers Mohamed and Aymen Jaber, who personify the rise of smugglers to power. The two had made their first big money as ordinary criminals in the Iraqi oil-for-food smuggling bonanza of the late 1990s and then prudently invested their newfound wealth into state-granted monopolies on the Syrian coast during Bashar’s first privatization wave. 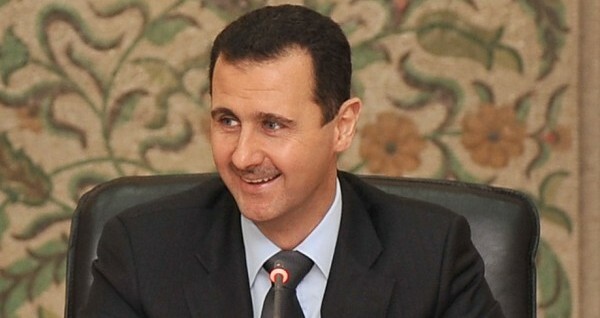 In August 2013, under pressure from outside sanctions and rebel advances, Assad signed a decree allowing private businessmen to raise their own militias in defense of their capital assets. With the stroke of a pen, the regime thus armed its own kleptocrats. Over the next three years, the brothers would run oil convoys and money laundering operations through Iraq and Lebanon, protect oil facilities, and, in the process, build one of the regime’s most formidable fighting formations. While vowing loyalty to Damascus, they are, in practice, independent of Syria’s chain of command, financing, recruitment, and even procurement process. The Hawks pay up to three times regular army wages, operate private training facilities, and produce their own fighting vehicles. This much independence can lead to friction on the battlefield. During the much publicized Palmyra offensive in March, tensions between the Hawks and other loyalists came to a head, after Jaber accused the Tiger Forces of deliberately firing onto one of his positions, killing nine and wounding two dozen more. According to multiple sources, including since deleted social media accounts, the militiamen were said to have drawn their guns at Hassan’s men and threatened to depart. In the end, Damascus dispatched a high-ranking delegation to reconcile the warlords and bring the offensive back on track. The units have not shared a frontline since. Rather than attempt to capture resource monopolies, certain armed groups have taken to making a profit by exploiting the suffering population directly. Consider the town of al-Tall, just north of the capital Damascus. Technically under a truce agreement with the regime, this small opposition community now houses hundreds of thousands of internally displaced people who have fled there from around the capital. Despite guarantees by the government, local loyalist militias tasked with manning the checkpoints in the area have recently begun leveraging a tax of 100 Syrian Pounds per kilogram on all incoming food products. Even a conservative estimate would put the monthly revenue of such a levy into the millions of U.S. dollars. This is enough to feed and supply the thousands of fighters manning the cordon, as well as their families. The watchdog group “Siege Watch” has put the number of civilians encircled by regime forces at an additional 850,000 across Syria. In these stricken areas, the cost of living has multiplied, with the difference syphoned off by those manning the bottlenecks. Put differently, with Damascus nowhere near able to finance and feed the families of loyalist militiamen, the encircling and taxation of civilians has an economic necessity for the regime to keep many of its most important frontline troops supplied and happy. This is not merely to illustrate the moral evil of the Syrian regime, but to drive home a more important point: With public wages barely enough to feed the conscripts themselves, Assad’s men have long begun feeding off the land and the civilian population. Today, the larger part of loyalist fighting formations no longer rely on the regime for the majority of their income, equipment, or recruits. While strategically valuable to Assad, it is by no means certain that the regime is fully in control of upholding a number sieges, especially in rural Damascus, Homs, and the Qalamoun mountains. A local source who moves regularly between Damascus and Ghouta by way of smuggling tunnels, told me of local rebel battalions run by Syrian Arab Army officers. As the country’s economy and governance institutions continue to falter, these “ghosts,” as Syrians colloquially refer to regime-aligned criminals, have come back to haunt those in power. Despite what color-coded “control” maps show, Bashar al-Assad retains very little meaningful authority over much of the territory he is said to rule. As the war progresses, these dynamics will inevitably lead to divergence of interests among local fighters and the regime, as well as Damascus and its foreign backers. An incident that occurred in February of this year may serve as an example of what lies ahead. Engaged in heavy clashes with rebel forces near the town of Harbinafsah, militia leader Ahmed Ismail called on his fellow warlord in the neighboring town of Baarin for desperately needed reinforcements. Fadi Qaribish, head of the Baarins armed men, rudely refused the request. The following day, feeling betrayed and with a local ceasefire having taken effect, Ismail turned his guns against Qaribish. Before long, he was joined by detachments from Hama’s air force intelligence, looking to support their preferred client and squash the insubordinate militant. But Qaribish successfully fought off the combined attack and subsequently established his own checkpoints along the roads in the area, cutting into Ismail’s smuggling routes to the rebel pocket. The regime has not dared bother Baarin since. Apparently too weak to coerce and too broke to bribe those who fight under its banner, Assad has made efforts to tie his subordinates closer to his Damascus by political means instead. This April’s parliamentary “elections” further indicated the structural transformation of the regime from a centralized state to a loose hodgepodge of warlord. A number of long-serving Ba’athist rubberstamp bureaucrats and local dignitaries, pillars of the regime’s traditional rentier system, lost their seats in favor of upstart smugglers, militia leaders, and tribal chiefs. The old guard took note: After results were announced, the supplanted agents of the regime in Hama dispatched an urgent delegation to the capital to warn Assad’s inner circle of the character and disposition of the men they had chosen to elevate. But for lack of alternative, Assad needs to keep these men close by. Some of these may prove more problematic than others. Assad’s kleptocratic maternal cousins, the brothers Makhlouf, have built a militia network of their own through their Al-Bustan Association, a private foundation, created before the war that funds both humanitarian relief efforts as well as armed groups. This spans the width and breadth of regime-held territory and is carefully kept outside of state control. At the same time, the Ba’ath party’s earliest political nemesis, the Syrian Social Nationalist Party (SSNP), has reemerged on the scene and already made tremendous inroads among the country’s Orthodox Christian and Druze communities, recruiting for their own growing military wing. Considering the historical role the Makhlouf family played in the SSNP, many in Damascus have cause to worry about centrifugal forces tearing the regime apart even further. Assad’s foreign sponsors are not much help either. Iran appears perfectly content with the muddled situation on the ground, having put great resources into developing its own client network across the country. Russia meanwhile, the country arguably most concerned with regime stability, appears to be oblivious to the entire situation. Its officers and soldiers are regularly photographed fighting and fraternizing alongside a wide range of tribal and sectarian militias. In one instance, photos surfaced of Russian soldiers fighting alongside members of the so-called Mountain Battalion, a small Alawite outfit that had made headlines last year when they announced the first ever loyalist suicide squad. Over the past three years, despite foreign military aid and support, the regime under Assad has continued to atrophy at an ever increasing pace. If these trends continue, the Syrian president will soon find himself little more than a primus inter pares, a symbolic common denominator around which a loose coalition of thieves and fiefdoms can rally. Thus, with the slow decay of the once powerful state, military, and party establishment, the person of Bashar al-Assad himself has increasingly come to embody the last remaining pillar not of a state but of “the regime” and its brutal war against its own citizens. The great majority of forces in Syria today, particularly among the regime’s minority supporters, fight an increasingly localized war for the protection of their particular communities. It is only through the continued existence of the regime — personified in Assad — that these defensive goals have been tied to an aggressive, national vision which we know to be unacceptable to a great majority of Syrians, disastrous to its supporters, and militarily unrealistic. While removing the tyrant may spark in-fighting among the surviving warlords, it would likely not mean a collapse of their forces and the slaughter of their villages. Latakia is being protected not by Assad’s largely imaginary “4th Corps” of the Syrian Arab Army, but by Mohamed Jaber and his merry men of the Desert Hawks. If indeed there is no strong bureaucratic and military class left that could salvage and revive the state and if loyalist militants have developed an increasing degree of self-reliance, then the situation is not as Western policymakers assume. Syria’s president has become not only perfectly expendable as guarantor of the state, but ought to be considered the last remaining obstacle to a peace process based on local ceasefires and return to displaced peoples to their home communities. This makes those calls heard in Western capitals, as well as Moscow, that Syria’s state institutions must be preserved ring hollow. All this suffering — to preserve what precisely? It is the fiction of a national regime upheld by Assad that drives the worst abuses of this war, that obliges Alawite kids from the coastal mountains and the plains of Hama to fight their own countrymen in distant corners of a country long fractured into smaller fiefdoms beyond the reach of the state. The United States should not be complicit in this pretension. The Syrian state is gone for good. At this point, a quick decapitation might be preferable to a drawn-out implosion. When Syrians first rose up, they demanded not just the downfall of Bashar al-Assad, but of the “nizam.” Commonly translated as “regime”, it more closely means “system”. Humanitarian suffering, state failure and — yes — terrorism in Syria are not competing concerns that need to be balanced, but symptoms of a singular disease: The mis-rule of Bashar al-Assad and his clients, cronies, and the petty criminals it has elevated to power.